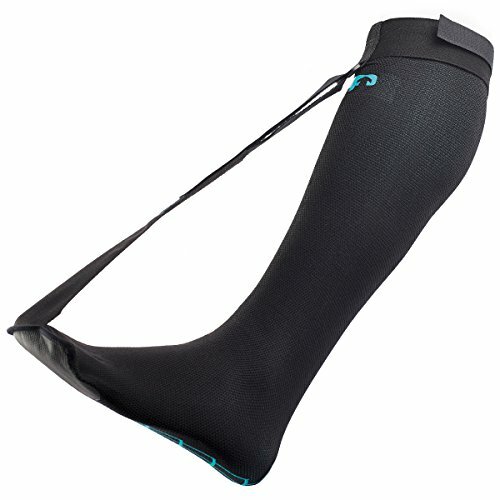 The ultimate performance® pf sock is a knee high sock designed to be worn overnight to help reduce and relieve the effects of plantar fasciitis. the adjustable strap system allows the wearer to adjust the level of dorsi-flexion to suit their needs; pulling the toes back up towards the knee as required. the pull on the toes causes the plantar fascia to stretch, when stretched for a sustained period (overnight) the tissues are encouraged to repair and heal in a better position which thus helps to reduce and alleviate the symptoms of plantar fasciitis and related heel pain. · perfect lightweight compact travel aid for those used to using a plastic hard form splint at home · one sock only per pack only, not a pair. only available in black. ·bi-lateral fit for use on left or right side. · sizing uk shoe size : small uk 6 - 8 (eur 39 - 42), regular uk 8 - 11 (eur 42 - 46), x-large uk 12 - 14 (eur 47 - 49.5). can also be used to reduce the symptoms of, and in conjunction with other remedies for achilles tendonitis. If you have any questions about this product by Ultimate Performance, contact us by completing and submitting the form below. If you are looking for a specif part number, please include it with your message.